Although he died over 30 years ago, anything associated with legendary Hollywood tough guy Steve McQueen seems to sell for millions. In fact, the actor’s former 1968 powder blue Ford GT40/Mirage Lightweight Racing Car recently sold at auction for $11 million, making it the most expensive American car ever sold at auction. Not to mention, the Porsche 911 that McQueen drove at the beginning of the film Le Mans sold at auction for $1.2 million earlier this year. The winning bidder will also receive a rare 1978 vehicle registration card, which incorrectly spells the actor's middle name as "Torrence" instead of Terence. Although he went by Steve, the actor's birth name was Terence Stephen McQueen. Bidding has currently reached $48,655 based on eight bids. The owner has not listed a reserve price, but the listing does indicate that the $48,655 amount does not meet the reserve requirements. A portion of the sale proceeds will be donated to the Boys Republic School in Chino, California, a cause supported by the McQueen family. This very same vehicle was listed on eBay in 2010 for a Buy It Now price of $65,000. 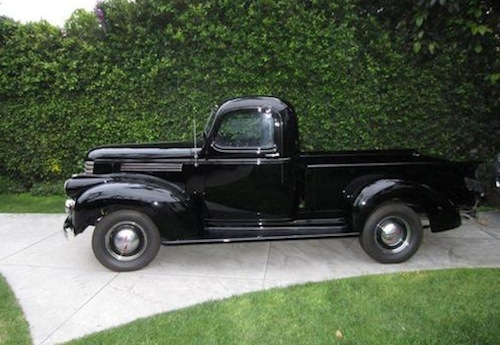 Oddly enough, McQueen’s truck was listed at a lower price than his Persol sunglasses sold for in 2006. The winning bidder paid an impressive $70,200 for the actor’s shades, which were prominently featured in the opening scenes of 1968’s The Thomas Crown Affair. Nicknamed “The King of Cool,” McQueen starred in notable films like The Magnificent Seven, The Blob, The Great Escape, Bullitt, The Getaway, Papillon and The Towering Inferno. The actor also starred in The Sand Pebbles, which earned him his only Oscar nomination. A top box office draw in his day, McQueen became the highest-paid movie star in the world in 1974. An avid racer of both cars and motorcycles, McQueen competed in weekend motorcycle races prior to becoming a star. In other celebrity car news, Torque News reported yesterday that Clark Gable's 1955 Mercedes-Benz 300SL Gullwing Coupe will be auctioned off later this month at the Barrett-Jackson auction in Scottsdale, Arizona. Cick HERE for more details.